This product has been a fascinating journey for me, I had never heard of True North Skincare, the brand is available directly via the company or at Harvey Nichols. This Scandinavian brand emphasises on de-stressing the skin while at the same time balancing. Read The True North story here. Here's the really fascinating part. How well do we know our skin? it's fascinating as unless you get analysis you never truly know what's going on. Without leaving your house True North offer you free skin analysis using today's technology via an app! yes- that's right. You can have your skin analysed in the comfort of your own home via your phone! simply download the True North Skin Coach App, it's free to use. 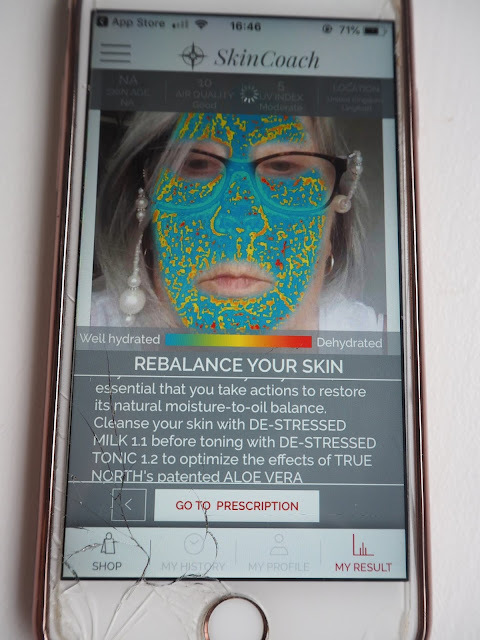 Using your phones camera the app will take a picture of your face, it lets you know if the lighting is right or wrong, and within a few moments you have a complete skin analysis. OK so I was dumb and left my glasses on! it tells you not to, I did follow the instructions and remove make up so at least I got something right. the app highlights all areas that need attention and produces a prescription for you. Here's the thing! being cynical Cynthia I expected the app to suggest that I buy the entire range, It DIDN'T it simply selected the few products that I needed to address my skin problem areas. In case you are thinking this is a novelty gimmick, interestingly I had my skin analysed not so long ago by a very well known brand in the beauty salon at Harvey Nix and the results are almost 100% identical!!! To say I'm impressed is an understatement. True North have you covered from your eyes to your armpits, stay with me and all will be revealed! This cleanser is unusual to say the least, it is not runny and lightweight as the name milk suggests, it is a rich emollient liquid that you apply to your face and neck using cotton wool, you then remove the product with warm water and a cloth, OK in typical Lynda style I had to try this out another way, I massaged the liquid all over my face and neck using fingers and then removed with warm water, both ways work equally as well, but I felt that I was getting more actual product on the skin rather than it soaking into cotton wool. I was left with fresh soft and non irritated skin, there was no tightness or redness in fact my skin looked simply calm. Used morning and evening or only once a day if you prefer this cooling eye cream is absorbed immediately into the skin, using a gentle patting motion it will leave the skin around your eyes looking and feeling more hydrated and smooth. I did quite enjoy this but I am not a huge lover of eye creams so it was something I had to remind myself to use regularly. Applied morning and evening under your day/night cream this is a stunning serum, it absorbs almost immediately leaving the skin softened and hydrated with no tackiness, you will actually spot a visible difference in your skin when using this serum, it seemed to have the ability to smooth fine lines and soften deeper wrinkles. I used this twice daily under both the Day De-Stressed 2.2 Dry Skin Cream and under the De-Stressed 3.1 night cream. Although strictly speaking my skin isn't dry as such, being mature it tends to err on the dry side which is why I went for the 2.2 day cream against the 2.1 which is for Normal/Combination skin. I thought as this cream was designed for dry skins it would be thick and possibly greasy, it wasn't alongside the serum it worked beautifully, my skin actually looked calm and fresh with a definite bounce to the texture. With an SPF of 50 this balm protects and softens the lips, I think often we under estimate the sun when it comes to lip protection, it's easy to pop on a gloss or a balm that has no protection and suffer with sore dry lips as a consequence, I used this balm under lipstick in the day and as softening balm overnight. Used with the De-Stressed Serum this was a fabulous night time treatment, non greasy while at the same time leaving a moisturising film on the skin. I used this on both the face, neck and decolletage, my skin was calm and soft in the mornings with no signs of irritation or redness. I think it's often quite difficult to spot an improvement in your facial skin but there was a definite visible improvement in the look and texture of the neck and chest area. I thought this was pretty odd a skincare line having a deodorant in it's collection, however this is no ordinary deodorant, you use the roll on which contains no alcohol or allergens, let it dry and it reduces the secretion of sweat and prevents the formation of odours. I gave this a thorough testing by using it for gym sessions, it worked really well, how do I know? well I sniffed and tested it! Plus with no perfume fragrance it won't overpower any perfume you are wearing. Containing Aloe Vera and Vitamin E, this rich lotion softens and hydrates while absorbing quickly, this is something I find really important in body products, there is nothing worse than having to lurk around the bedroom or bathroom waiting to get dressed while your moisturiser does it's thing, this left my skin soft and hydrated, which actually lasted right the way through the day. I have thoroughly enjoyed testing out this range, the common theme of Aloe Vera running through the range both softens and balances the skin leaving it both calm and hydrated, the simplicity of the range adds to the attraction, no bells or whistles, just simple clean ingredients. For more information on the ingredients in the range, please visit the True North website. and don't forget to download the app and analyse your skin.